Hamilton Tennis Club’s main championships concluded with an exciting and close-fought mixed doubles final. The match pitted Penny Hallam and Will Harrison against Joe Jackson and Emily Harrison with the result in doubt until the end of a long contest. Penny and Will lead for most of the first set with some good interceptions by Will, and well-angled volleys by Penny, but Joe and Emily hung on to force a tie-break. But Will and Penny won through by seven points to three. The second set was again very close with neither pair taking control, but consistent returning from Joe and Emily put pressure on their opponents’ service games and they eventually took the set 7-5. Adventurous rallies were a feature of the third set, with some wonderful retrieving by both pairs, but Joe and Emily finally broke serve to lead 5-3 and Joe held his nerve to serve out for a 6-7, 7-5, 6-3 win. 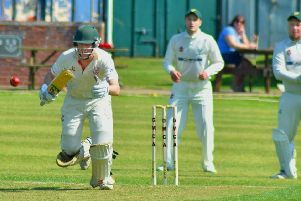 * There were some disappointing results for Hamilton on the league scene with the men’s second team of Andy Stevens and Ciaran Boylan, and Doug Hacking with David Gildove losing 8-0 in the rain at Oakham. The men’s fourth team of Graham Brown and Stuart Posnett, and Patrick Whenham-Bossy with Steve Plaistow also lost by the same scoreline against Wigston Thirds. There was another whitewash as the ladies’ second team of Polly Dolby and Jan Jackson, and Margaret Shufflebotham with Eileen Merrison came up against a Belvoir Vale team which are clearly too strong for Division Six. Gynsill, with Edwin and Mark winning the two sets.